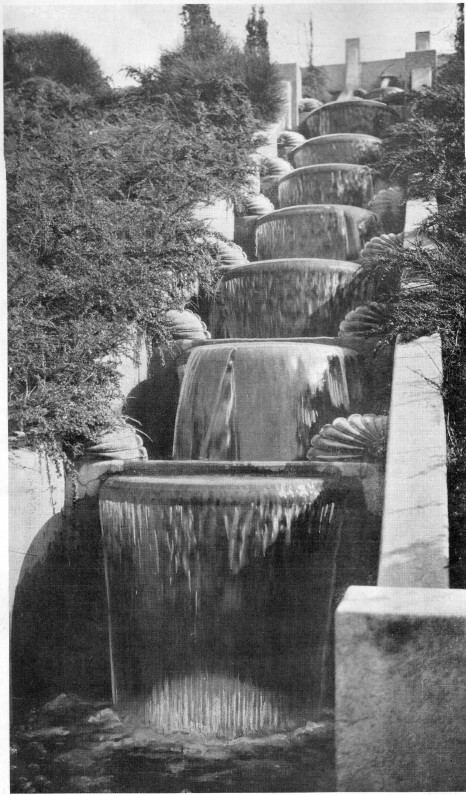 The Cleveland Cascade was an Italian-inspired cascading water feature, landscaped by Howard Gilkey in 1923, within Cleveland Cascade Park, just across Lakeshore Avenue from the north-eastern shore of Lake Merritt. Semi-circular bowls made for sheets of water stepping down the hillside, and at night, it was lit by colored lights. There used to be water flowing down the Cascade, but now it's just a cool set of stairs and some plants. The water flowed down the area where the large potted plants sit today. The area where you walk (with stairs) never had water flowing down it. The cascade was likely shut down during WWII. It was reactivated, but over the years it fell into disuse and disrepair, and became overgrown. In 2004, area residents got together and re-discovered the cascade, and cleaned out the plants and garbage. Since then the Friends of the Cleveland Cascade have raised funds and had new railings and lighting installed on the stairs, had replacement pieces for the cascade cast, and are continuing to raise money to have the cascade restored to its former glory. While the fountain is gone, there are sets of stairs that people often use for exercise. Here’s a video of boxer André Ward that includes him talking about how great Oakland is while he runs up the Cleveland Cascade stairs. At a city council meeting in January, 2014, a resident of a building along the Cleveland Cascade complained about people using these stairs day and night for exercising. She stated that the lights are on from 4am to 10pm allowing this nefarious business to happen, ignoring the needs of residents. There is an amazing amount of history at the Friends of Cleveland Cascade website.